Here’s how it happens: when you book, you pay your invoice & tell me times and days that work best for you, and I send you some time slots as options. Then, when you book your time slot, you send me the copy you want to improve on, and it can be anything: Any of your website pages, your email autoresponder, ads, sales pages, landing pages, printed brochures (sent via digital copy). You name it…. if it’s got words on it, I’ll help you with it. After I receive your copy and some information about your goals for it, I’ll read through it, and take notes in a document dedicated just to you, your copy, and the goals you have for that copy. Normally, my consulting rate is $250 per hour… but at this rate you save $50 and get ~30-45 minutes of my dedicated note-taking time beforehand so when that hour starts we jump straight into getting to the heart of what works for you and your business, rather than wasting any precious seconds of the call figuring out what’s going on. You’re tired of your copy being “good enough” but not truly wow-ing the people it’s written to impress. You just want better results, already. You know you could be converting more, but for the life of you can’t figure out how. You have an open mind and aren’t too attached to anything you’ve already written. This isn’t a precious-flower poetry class, and I WILL tell you the truth about what needs to happen for better resonance & conversions. 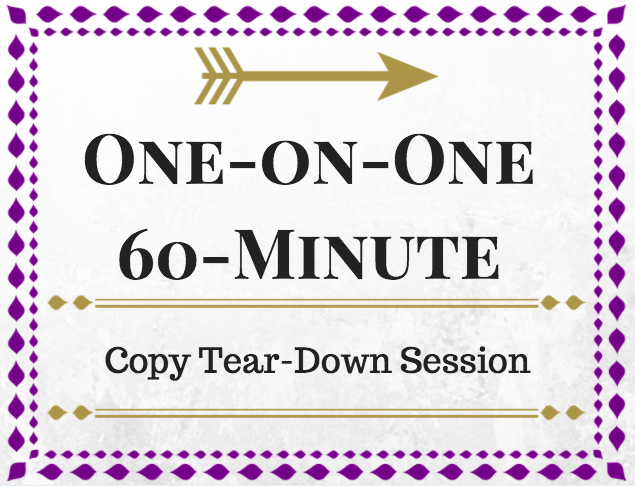 You’ve got an hour to spare that you’d like to use to help improve your business. You’ve always kind of wanted to work with me, but haven’t had the time for a one-month project and/or the budget to hire me for all-out website writing.